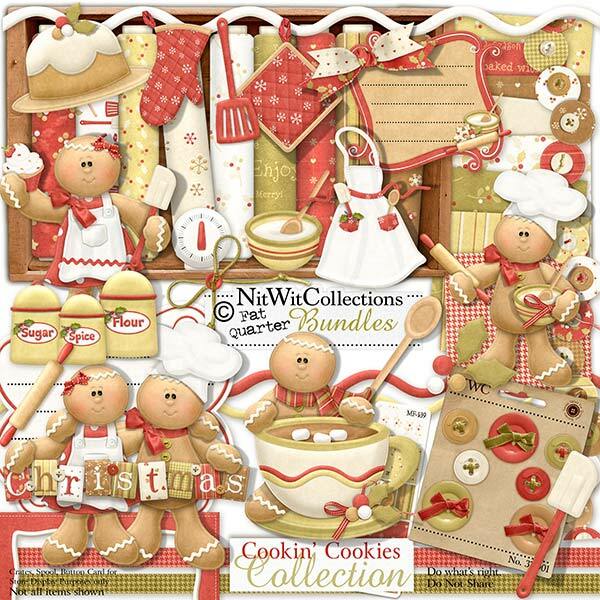 My "Cookin' Cookies" Collection is all about Christmas baking, and who doesn't love Christmas baking?! It includes all of the cooking embellishments you'll need for your scrapbooking elements or cards, minus the lard and eggs and such, as I didn't want to be responsible for "goo-ing" up your computer!ha,ha I even included some helping Gingerbread people in case yours get a little burnt. Spread a little icing on these and I know that your guest will be talking about them....(good or bad?). I hope you enjoy this Collection and that you're baking includes more calories than this! 1 Chef Hat - you need to look the part! 1 Oven mitt - I think my dogs stole the other one?